Water, Wind and Steam Power, they were eco then! 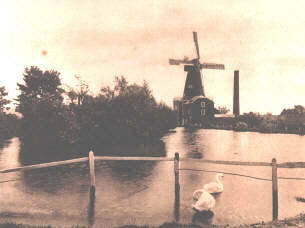 Once upon a time, the Lane was buzzing with activity, A Steam Mill, Watermill and the Windmill. All three stood proudly accross the local skyline and were employment to many.Like we painted gloss paint over antique furniture and followed Barry Bucknell in hardboarding over panelled doors, we also lost many fine parts of our heritage when industries were no longer needed. We can't blame them solely on the fact they didn't know better. How many old toys have we thrown in the dustbin to find them worth £500 on The Antiques Roadshow. Hindsight !! gardens and general atmosphere of the House conquer a good feel for it's past glories. of any machinery, just a few rotten shelves and old electrical meters etc. on the door, once the toilets although probably no more than 80 years old. Materials from the Mill were transported by train, the railway line coming from a junction on the Canterbury - Ashford line some half a mile due east. One can only presume that where the line was is adjacent to the stream. There are no signs of it. The fields to the east were used as a Training Area for the Army during the wars and according to neighbours, they were in use until the 1950's. There are some remains of old buildings in the field, one of which was an old Shepherds Cottage. One other thing which has come to light recently is that where our house is was actually a Plum Tree Orchard. This brings about the question of 'why are we 'Bramley Cottage'! on around you. They may have pulled down much of the material, but they can't pull down the history. This mill was unique in many respects, seeing that three types of motive power were used, namely wind, water andsteam. water flowing alongadjacent. The steam providing the power for the water mill actually came from the Eastwell Lake. Mill and was very high up above the water level. No trace remains of this today. Way back in 1886 this Mill was worked by Mr. Henry Sturges Pledge who had, prior to this, been the Miller at the Black Mill on Barham Downs in 1850. Subsequently, Mr. Pledge founded the well known flour milling firm of H.S. Pledge & Sons Ltd. Of Victoria Flour Mills and, until a few years ago, of East Hill Mill, which was then sold. Incidentally, East Hill Mill, bearing the date on the Tower as 1901, has now been taken over by Developers and will soon be opened as a Leisure and Sports Centre, with a Restaurant, a Public House and Night Club. What memories I have of Pledge's, seeing I was in the Office in Victoria Street, during 1934 until 1959.
production and the sweeps were taken down and transferred to the Mill at Forge Hill, Pluckley. Benenden and Woodchurch are having much needed work done on them. As the name implies, all three motive powers were used here. The water, which came from Eastwell Lake, is no longer to be seen and the steam shaft is not now standing. 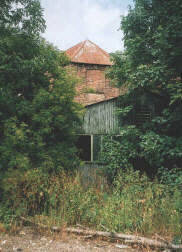 The sweepless body of the tall smock windmill, however still remains. The weather boarding has recently been repaired to some extent and re-tarred, a Canterbury builder having undertaken this work. The life of the structure has therefore been prolonged. It is however just an empty shell, all machinery having been cleared out and floorings removed. It was erected in 1813. This is confirmed by the headstone 'YD H 1813' The initial H refers to Hill, the Ashford millwright's, who were the builders. It is said to have been built for Daniel Young, one of a long line of Millers. 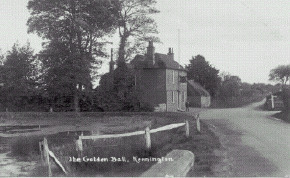 The present owner is W. J. Jennings of Kennington Hall. In 1886 all three mills, wind, steam and water, were in full swing under H. S. Pledge, who later transferred the trade to Steam Mill at Ashford, where a large business has been developed. 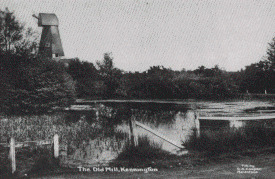 It is many years now Kennington Mill was worked; the last Miller was Charles Stanley from Blean. He took over the business in 1892. The sweeps were removed soon afterwards and sent to Pluckly Mill; the fragments of them are keeping company with the sad derelict to this day. During the Great War the Mill was used as a Signalling Station. A Miller frind writes; I wonder if you know of what wonderful combination of the Kennington Mills, near Ashford. I believe it to be unique. The house and the watermill are on one side of the lane, a steam mill opposite with a windmill built upon the top of the steam mill, and a footbridge over the lane from the top floors of the water and steam mils. Of course, it is all in decay now, but it just did make a joyful noise once upon a time. Of the footbridge no trace remains today, except that the ends of the beams that formed the bridge can still be seen in the brickwork.